Cloned from Legionnaire by Patrick Lauke (redux). 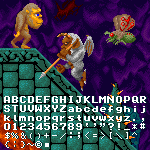 Recreation of the pixel font from TAD Corporation's "Toki" (1989), which was later used in "Blood Bros." (1990). Only the characters present in the game's tile set have been included. Info: Created on 11th April 2017 . Last edited on 11th April 2017.